“Nobodies are looking at us.” “That person is doing the something.” Despite following those bad cycles, why don’t YOU start to respect town’s manner? 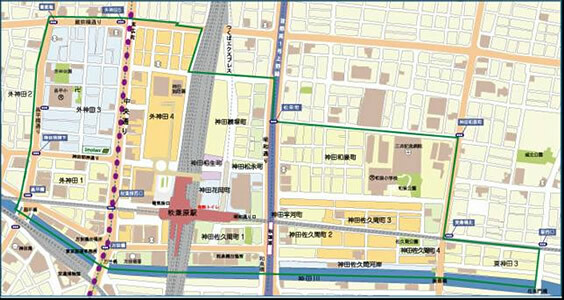 In 2002, Chiyoda-ku established a municipal ordinance called “Safe and Adequate Living Environment Plan in Chiyoda-ku”. Accordance with the ordinance, the municipality sets targets which make the town safer and more pleasant for the citizens, and helps citizens to participate in various related projects. 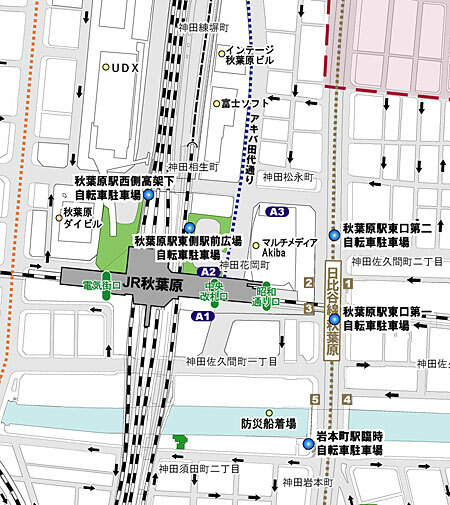 The map below, the neighborhood area of Akihabara Station, shows an example of this plan. Inside the green line is set as a parking restricted area as well as a secure and clean environment model area. Also, violet dots on the map show that this area is targeted as a strict monitoring area for illegal parking. Do you know that the ordinance also has penalty provisions for those who violate the regulations? Not as you obey the rule, because there is a rule, but your goodwill to respect manner is now under the question. ※Currently, the fine is usually 2,000 yen. According to the ordinance, Safe and Adequate Living Environment Plan in Chiyoda-ku, smoking and trashing a cigarette end are prohibited all day within the nonsmoking area. An offender to this regulation may face a fine up to 20,000 yen. Currently, the fine is usually charged for 2,000 yen. Also, it is a citizen’s obligation to not smoke on the street other than the nonsmoking are (the ordinance Article 9.2). In order to keep our town clean, we need to respect the rule. Chiyoda-ku has encouraged a restaurant to have a nonsmoking area, so that citizens of our city could enjoy meals in a clean and secure place. Chiyoda-ku introduced a registration pass sticker called “Clean Air Restaurant” which is made under the intention of that people could be easily acknowledged nonsmoking eateries. 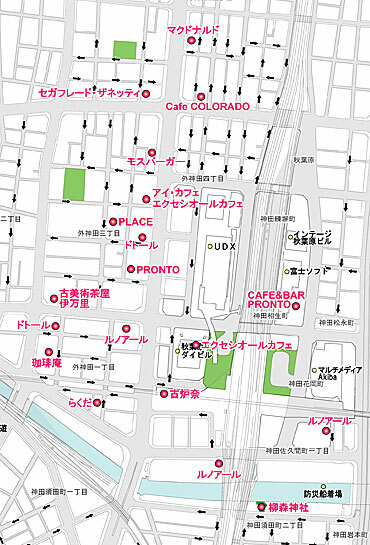 The lists below are some examples of restaurants with the sticker in Akihabara area. We hope that those who are looking for a nonsmoking restaurant could find this sticker useful and could enjoy meals in a clean aired room. We also hope that smokers could realize the sticker, and they could have a little break form smoking habits. For registration of the Clean Air Restaurant project, please contact Chiyoda-ku Health Center. Registration is free of charge. City of Tokyo as well as municipality of Chiyoda-ku have ordinances to regulate advertisement, such as billboards, flags, posters. The Tokyo Advertisement Ordinance defines advertisement as 1) billboards, standing signboards, posters, ad pillars, etc 2) which put on the public space 3) for a quite long time 4) to target the public to notify specific things. Whether it is for commercial propose or not, any advertisement that follows under the above definition is handled as advertisement, and needs registration before putting on the public places. Illegal parking may cost to disturb smooth rescue operation during a time of emergency. Parking on the road, except a public parking lot and a parking space with a parking mater, is prohibited and could be a subject to penalty charge. There are many public parking lots for cars as well as bicycles in Akihabara area. Please check your nearest public parking lot from the web sites. Within the model area, throwing away garbage, such as cans, on the street or in a public place is prohibited all day long. To keep our town clean, violation of this manner might cost as a fine of up to 20,000 yen. For now, 2,000 yen is usually charged as actual fine. To maintain our town clean and healthy, please pay attention to the decent manner. Copyright (C) 2012 Akiba TMO. All Rights Reseved.